It is a medical device that studies the behaviour of the upper respiratory tract by means of the analysis of the air flow in the nasal cavity. Performs respiratory analysis using a CT scan of the patient’s nasal cavity and paranasal sinuses, integrating interactive visualization and simulation of Virtual Surgeries tools. NASAL~FLOW® has been designed for use by ENT specialists. It is indicated for use in patients with upper respiratory tract problems. With a USABILITY designed to provide the professional a simple and friendly handling. The results obtained will provide the medical team with valuable information that will help them in the usual clinical practice to accurately detect the different alterations in the upper respiratory tract of patients, serving as a support for the diagnosis and decision making of the medical professional. Improving the medical service of patients. NASAL has performed a clinical study that shows that NASAL~FLOW® is able to diagnose nasal obstruction in the upper airways obtaining results of 63% sensitivity and 87% specificity. NASAL~FLOW® is the only device capable of determining the airflow rate in septal perforated nostrils and provides more complete and detailed information than an acoustic rhinometry test. 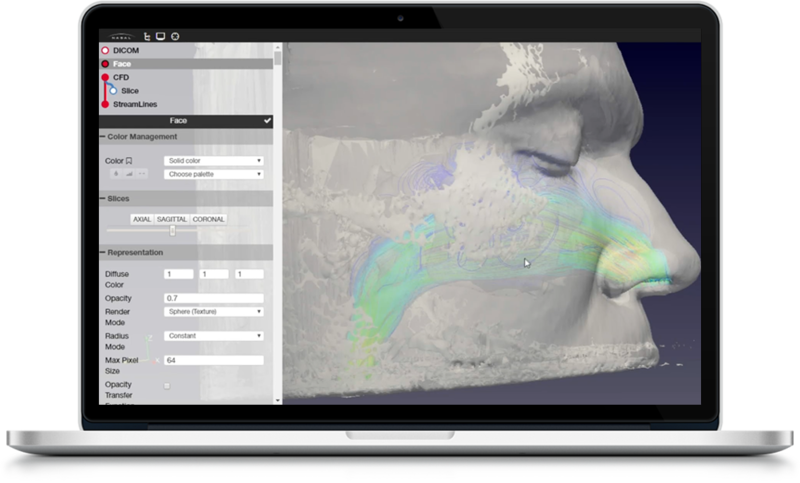 NASAL~FLOW® performs a breathing simulation that allows exploration of the results with a level of detail capable of diagnosing nasal obstructions difficult to detect by usual clinical practice. By means of the analysis of medical images (CT) the physical phenomena that occur inside the nasal cavity of the patient are analysed obtaining and providing information of the functionality of the nasal cavity. NASAL~FLOW® makes a measurement of the perimeter of the nostrils, the area of the entrance and exit to the respiratory tract as well as its total volume. The flow rate is quantified on each side of the airways in order to determine a lack of airflow traffic. On the geometry of the anatomy, the zones of suffering/stress by the friction of the air flow in the walls of the nasal cavity are represented. A colour mask is measured on the geometry of the anatomy, indicating the pressure values at any point in the nasal cavity. On the geometry of the anatomy, the velocity of the airflow in the different anatomical zones of the nasal cavity is obtained. It is observed, on the geometry of the anatomy, the transfer of heat from the airflow during its transit in the nasal cavity. 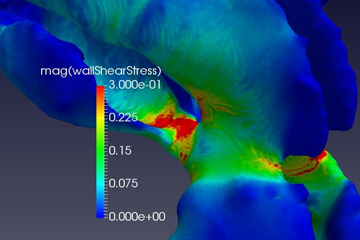 The result of the flow analysis is provided in a report. Its objective is to read the results in an agile and detailed way. A report is obtained in PDF format once the case has finished. A study that represents the air flow is generated. This report provides quantitative information on the functionality of airflow in each patient’s nasal cavity. The PDF report consists of the following data. The geometry generated can be freely compared with the radiological study, with the patient’s facial surface and with the results of the flow study in an agile and interactive way. The result can be analysed with more detail and precision thanks to its interactive handling. 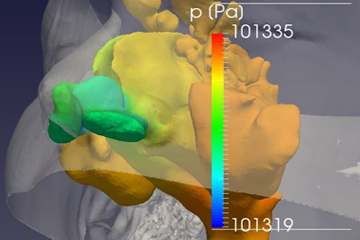 The 3D viewer has the option to visualize the patient’s CT on the geometry of the anatomy. The facial reconstruction created through the patient’s CT scan can be displayed. An endoscopic examination is possible. Virtual Surgery is a tool implemented in NASAL~FLOW® that allows simulations of surgical interventions in the patient’s CT. It is possible to draw air or tissue on each medical image which allows the simulation of a surgical intervention of the patient and obtaining a post-operated nasal cavity. 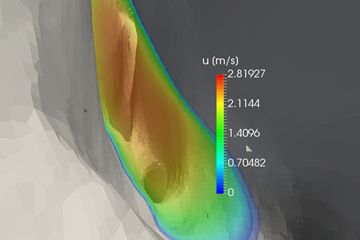 Thanks to NASAL~FLOW® it is possible to make a new analysis on the virtually post-operated nasal cavity to check how its functionality changes. It is a non-invasive technique and very beneficial as it can reduce the rate of post-operative failures. medical professionals, care networks or insurance systems. NASAL~FLOW® has different marketing models. It is an online service for the use of the full potential of the device. Through the acquisition of credits from the web platform, flow studies can be carried out on demand. NASAL~FLOW® has a comprehensive model dedicated to the patient through the acquisition of NASAL~FLOW® BONUS. It is a service destined to the patient for the comprehensive treatment of nasal obstruction through the analysis of respiratory flows. NASAL has a network of contracted centres for carrying out diagnostic tests and medical treatment included in the service. If you would like more information about NASAL~FLOW® BONUS please fill in our contact form. It is a device for the analysis of respiratory airflows that is installed in the medical professional’s office. It is contracted for a year fee, can perform more than 400 analyses per year and has the ability to use all the features of the device. Fully automated, in which the medical professional will only have to insert a pen drive or CD/DVD with the images from the CT to send. The device automatically carries out the case study. If you would like more information about NASAL~FLOW© IN-HOME please fill in our contact form. It is a system designed to be used in an healthcare network or insurance system, fully automated and performs a respiratory airflow analysis for each CT scan of the nose performed in that network. 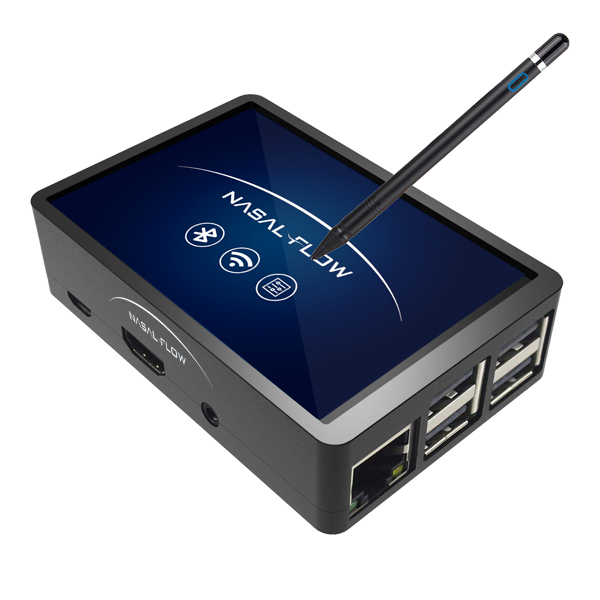 NASAL~FLOW® IN-HOUSE/ON-CLOUD is acquired through an annual contract. Remotely, respiratory airflow analyses are performed automatically, without any kind of user interaction in the process. The device is installed in the healthcare centre itself. The device is installed in our data centre. NASAL~FLOW® IN-HOUSE/ON-CLOUD are synchronized to the CT machines of the healthcare network, using our digital medical image archiving system (PACS). Attached to the TAC is the report of the results of the analysis. The rest of the tools can be accessed from the platform. 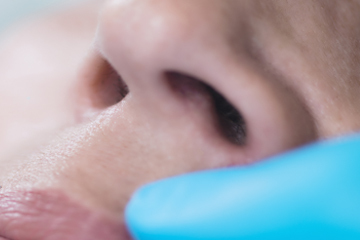 NASAL~FLOW® has a guarantee equivalent to the duration of the contract, so its operation is guaranteed through maintenance and technical service that resolves problems of use and detects unexpected results. NASAL~FLOW® is designed to perform airflow analysis with a guaranteed response of 6 hours for the NASAL~FLOW® IN-HOUSE/ON-CLOUD model and 24 hours for the NASAL~FLOW® IN-HOME model. In the other models the time is 6 hours from interception. 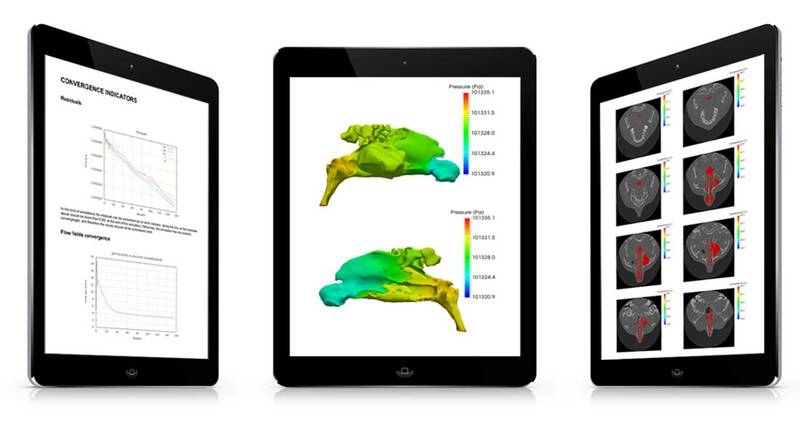 Perform the number of virtual surgeries required and request a flow analysis for each simulated surgery to decide which of the interventions is the best functional solution for the patient. 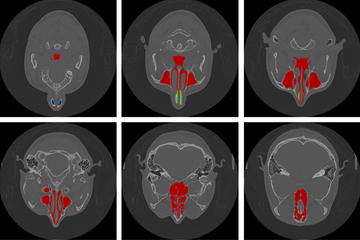 Automatic flow analysis for each nose radiology study performed on the associated CT machine. 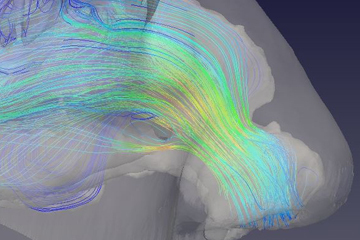 Tool that allows the realization of virtual surgical simulations with the possibility of manually requesting flow analysis of each one. All data generated from device activity is stored on our servers and maintained for the duration of the contract. NASAL offers a face-to-face training day. It is available to users as an attachment to the device: user and service manuals online use courses from our platform, interpretation of results manual. Enjoy anatomical identification and endoscopic simulation applications for ENT (nose, orbit and temporal zone).